Day 1: Airports, and Rental Cars and Squid Ink, Oh My! It was a long, long, long flight. Okay, so maybe only 8.5 hours, but still, it was cramped. Okay, so maybe we were in Economy Plus, but still, it was… actually over pretty painlessly. Staff on the flight was great. Biggest trial and tribulation was having to wait for my in-seat entertainment system to reboot. They woke the plane about 8AM local time to feed us a light breakfast of Croissant and yogurt. 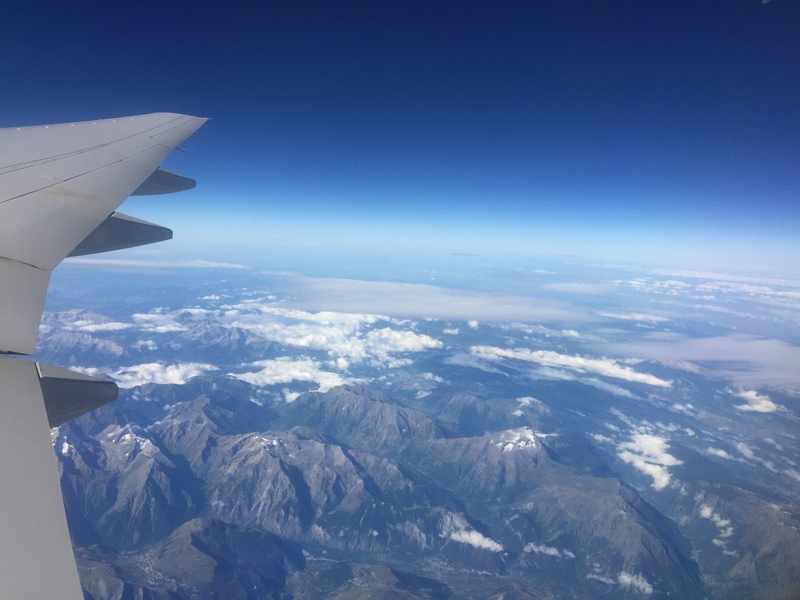 Then everyone started opening their windows and realizing we were flying over the Italian alps. We landed in Roma just about on schedule, and as the captain said, we were on a seriously long taxi route from the runway to the gate. The bell rang, and everyone stood, as you do… and then we waited. And waited. And eventually the captain came on and told us that they couldn’t seem to find someone to drive the jetway so we could get off the plane. They could see crew standing on it looking at us, but no one there could move it. That was kinda funny. Turns out the jetway was busted. So NO ONE could move it. 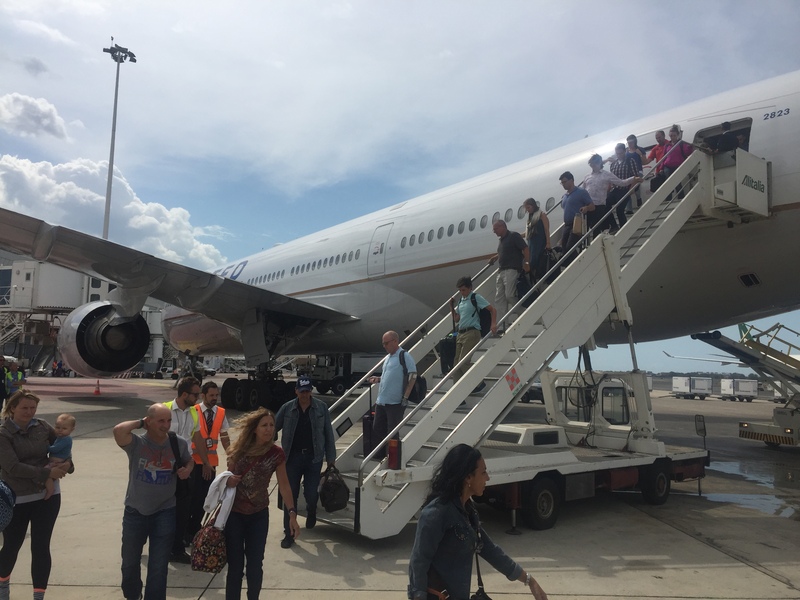 So they took us out the aft exit on the airstairs and then bussed us over to immigration (not as bad as it sounds), which saved us a long walk through the terminal. Immigration and Customs was easy, and it was a (relatively, once we identified the right signs) easy trek to the car rental place to get our car, which is much too small for all our luggage. It’s a good thing mom is skinny. Fortune smiled on us, and we quickly found the highway towards Napoli, and sooner that I actually expected, we were on the road. Rome, or right out side of it, near the airport, looks a lot like Redding. All three of us remarked on this separately at one point or another. But the scenery quickly turned to slightly less hot/burnt looking, and we ran into our first traffic snarl — turns out it was just the “take your turnpike ticket” booths. It was about a 3 hour drive down to Baronissi, where we were stopping for day 1, so of course we had to make at least one pit stop. Much like the Jersey turnpike, the toll highway here has service plazas with gas, food and bathrooms. So about two hours in, we stopped for a bio break, and a leg stretching break. The food in this “service plaza” all looked amazing. And dudes, all the Ritter Sport you could ever want. Back on the road, and we had about an hour left. We got to Hotel dei Principati about 4:00, checked in and immediately took showers, then a two hour nap. Oh holy god, naps are amazing. Around 7:00 we were all conscious again, so we made plans to just eat right here in the hotel. Dinner service didn’t start until 8:00 though, so we had a bit of time to look out the windows while we waited. Dinner was quiet and quite tasty. Dad had Linguini and Clams. Mom had Spaghetti with Sun Dried Tomatos. And I had the Squid Ink Risotto. All in all, it was an exhausting, but super good day. Mom and Dad are already asleep, and I am fighting the head bobs right now, myself.